Timo Lumme is the Managing Director of IOC Television & Marketing Services, the broadcast rights marketing arm of the International Olympic Committee (IOC). As Managing Director, Timo is responsible for the sale of television and new media rights to the Olympic Games, the negotiation and sale of Worldwide Olympic Partnerships, and the management of the IOC’s global sponsorship programme known as TOP. His responsibilities include the development and implementation of the IOC’s strategic marketing plan and oversight of Olympic marketing programmes worldwide. Timo joined the IOC from ESPN where he worked as Vice-President Europe, Middle East and Africa (EMEA) since 2001. 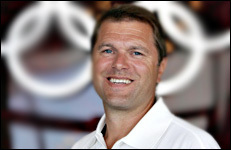 He combines a strong background in the worlds of marketing and broadcast with Olympic Games experience. He started his career with the International Management Group (IMG) where he held several marketing and management positions in London, Paris, Milan, Albertville and Lillehammer. Specific Olympic Games work includes the 1992 Albertville and 1994 Lillehammer Olympic Winter Games. Other achievements include three years at Nike as European Sports Marketing Director, negotiating and overseeing commercial sponsorship arrangements with over 1,000 athletes, teams, events and federations. He also worked in new media for Quokka Sports, most latterly as general manager for nbcolympics.com, complementing NBC's coverage of the Sydney 2000 and Salt Lake City 2002 Olympic Games. A qualified lawyer from the London firm of Slaughter and May, Lumme speaks five languages (Finnish, English, French, Italian and German).